The Rapidprint series of Mechanical Time & Date Stamps set the performance standard to which all others are compared. There is a reason the Rapidprint series are the best of the best, as they provide reliable performance coupled with long-life durability. They are great for imprinting a variety of time, date and message (with die plates) combinations, so you never again have to be at a loss as to when things are occurring in your business. The Rapidprint ARL-E provides an effecient, cost effective way to print numbers time & date on your important documents along with an easy-to-read digital clock face. These time-date stamps allow for quick recording on all your business forms from onion skin to1/4" thick. The Rapidprint ARL-E allows for the addition of upper and/or lower die plates for static text to be included with each time-date stamp. Die plates can be purchased separately and can be included with the time-date stamp pre-installed (allow extra time for delivery, whether pre-installed or not, die plates can take up to three weeks for delivery) Text (or die) plates can have up to 3 lines of text above or below the time-date imprint (19 characters per line including spaces). 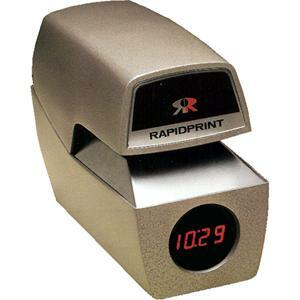 Dimensions: 7.69" x 4.69" x 10.81"
Rapidprint offers a one-year manufacturer's limited warranty. Warranty does not include consumable parts. With few exceptions, all are returned to depot for service. User must pay for shipping to depot. Repaired products will be returned with the shipping charges prepaid.